It is quite a common thing that musicians and artists that are exposed to loud noise, will eventually suffer from hearing damage. We have seen many artists suffer from this career threatening damage, the likes of Phil Collins, Eric Clapton and Ozzy Osbourne and the tinnitus that is effecting Chris Martin from Coldplay, this is a problem that many more will be affected by. This article from the BBC talks about Chris Goldscheider and his pursuit of damages over his hearing damage. Rightly or wrongly itâs an interesting tale. A renowned viola player is suing the Royal Opera House for ruining his hearing and his career during rehearsals of Wagnerâs Die Walkure. Chris Goldscheider claims his hearing was irreversibly damaged by brass instruments put immediately behind him. The Musiciansâ Union says hearing damage is a major problem for musicians playing in orchestras. 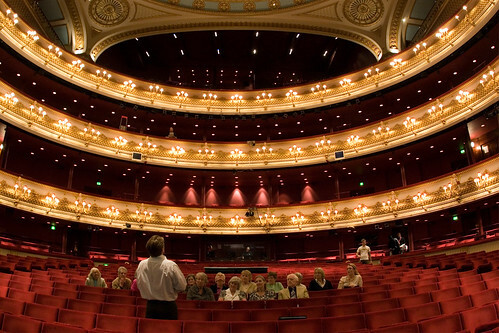 The Royal Opera House denies it is responsible, but around a quarter of its players suffer hearing illnesses. In court documents seen by the BBC, Goldscheider claims that in 2012 his hearing was “irreversibly damaged” during rehearsals of Richard Wagnerâs thunderous Die Walkure “from brass instruments placed immediately behind him” in the famous “pit” at the Royal Opera House. The sound peaked at around 137 decibels, which is roughly the sound of a jet engine. The court documents say the noise “created an immediate and permanent traumatic threshold shift”. Goldscheider says this amounts to “acoustic shock”, one effect of which is that the brain hugely amplifies ordinary sounds. Music has been in most of Goldscheiderâs life: “For the last quarter of a century Iâve been a professional musician. Music was my income. It was my everything,” he says. The son of a composer, from the age of 10 he spent in excess of six hours a day practising and rehearsing. He played the viola with the Royal Liverpool Philharmonic and BBC Symphony orchestras, before joining the prestigious Royal Opera House orchestra in 2002. Career highlights have included performing live with the famous Three Tenors to 100,000 people at the Barcelona Camp Nou football stadium, and with Kylie Minogue on MTV. He has also recorded with artists including the band 10cc. Goldscheider says the effects of the hearing damage have been devastating. “Ordinary sounds like banging cups and glasses together is a very painful noise,” he says. The musician says he has lost the career he loved and his mental health has deteriorated as he struggles to cope with the impact and effects of his hearing problems. Life has changed dramatically. To carry out ordinary every day tasks such as preparing food, Chris has to wear ear protectors. Especially upsetting is that he had been unable to listen to his 18-year-old son Ben – one of the countryâs outstanding young French horn players. “Ben is a fantastic musician. I havenât been able to listen to him play or practice since my injury. Iâve missed him playing concerts and winning competitions. I canât even bear him practising in an upstairs room when I am downstairs in the house,” he says. At the time of his injury, Goldscheider was provided with hearing protection capable of reducing the noise by up to 28 decibels, but his lawyers claim this was insufficient. They say he was not given enough training in how to use it and protect himself, and that the noise levels should not have been so dangerously high. The Royal Opera House does not accept the rehearsal noise caused Goldscheiderâs injury, and denies that is responsible. In a statement it told the BBC: “Mr Goldscheiderâs compensation claim against the Royal Opera House is a complex medico-legal issue, which has been going on for some time and is still under investigation. And according to Goldscheiderâs solicitor Chris Fry, part of the Royal Opera Houseâs defence breaks new legal ground. “Essentially what is being said is that the beautiful artistic output justifies damaging the hearing of the musicians performing it,” he says. Brian Johnson of AC/DC and Ozzy Osborne have also been affected. But what is far less well known is that it is a significant problem in the more sedate and sophisticated world of classical music. There are around 100 players in the orchestra at the Royal Opera House. The BBC has learnt more than a quarter report occasional or mild hearing illness, and that in the 2013/14 season, there were seven cases of sickness absence related to noise problems and a total of 117 weeks of sick leave taken. Thatâs not music to anyoneâs ears. Morris Stemp of the Musicians Union says there are many reasons for the hearing damage suffered by classical musicians. Add to that the increased number of live concerts prompted in part by the drop in income from CD sales, and there is a mix of elements that can put the hearing of orchestra players at serious risk. Chris Goldscheiderâs case casts light on a little known or discussed problem, and will be watched closely by all those in the classical music world.